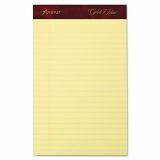 Ampad Gold Fibre Writing Pads, College Rule, 5 x 8, Canary, 50 Sheets, 4/Pack - Perforated pad is ideal for office and home use. Watermarked paper will not bleed through. Leatherlike binding at top is stapled and glued. 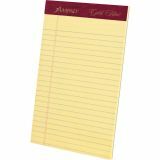 Extra-thick, chipboard back offers stiff support when writing. Microperforations allow clean separation. Pad contains 50 sheets. Each sheet is college-ruled with 9/32" line spacings and a 13/16" margin.